Astarte Moon Inspirations a life closer to nature's rhythms : Our pets often teach us the wonder of unconditional love. Gratitude pets quote. Our pets often teach us the wonder of unconditional love. Gratitude pets quote. 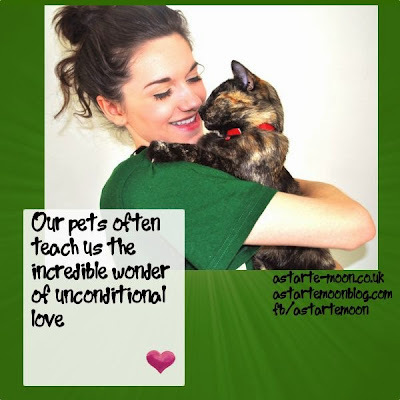 Our pets often teach us the wonder of unconditional love. Often our best friends in the whole world our cats, dogs, fish, guinea pigs, and rabbits give us so much love and so much to give gratitude for. They are there at the end of a hard day to just listen and be there for us, always happy to see us. Do you have a pet who is special in your life? My Miss Minga is my best friend. This little kitty has been by my side for 22 years now. In fact, as I type this, she is curled up on a little pillow bed at my feet. I have these little beds placed wherever I sit because of her need to be near me. I love her dearly and know her time to pass over will now be counted in weeks, not years. She has truly taught me the wonder of unconditional love. I say this often when I talk about her. Very true. Penny has taught me so many deeply profound things - things I probably would not have been able to learn from humans. I have Yoda-Chan. He is my heart and sadly not long for this world. He's in the beginnings of renal failure. He's putting up a good fight, I think sometimes for my benefit. He's still lively and perky but also lethargic. As much as I want to keep my handsome prince with me forever, I will not stand to see him suffer. My Mom-in-Law thinks we should spoil him rotten until the end. I have another kitty, Galen-Gladamir or (Galen-Monster, as I some times call him). He's a little punk! But I love him just the same. I think he knows what's going on his buddy and I think he might be a little scared. He didn't do so well when Yoda was at the vet for a few days. He was really confused and looking for him. Still, both boys are pretty resilient. They've moved half way across the country three times and been on a couple of adventures! They will be okay! I have always grown up with animals ;o) Dogs and cats ;o) My mom and I really want to get another cat. Our cat and dog went over the rainbow bridge a few years back. Both, we had to put down. Old age. Still brings tears to my eyes.